"WASHINGTON -- As 2012 comes to a close, the 112th Congress is set to go down in American history as the most unproductive session since the 1940s. According to a Huffington Post review of all the bills that hit President Barack Obama's desk this session, Obama has signed 219 bills passed by the 112th Congress into law. With less than a week to go in the year, there are currently another 20 bills pending presidential action. 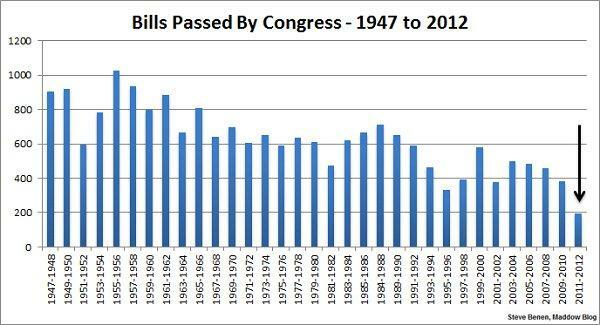 In comparison, the last Congress passed 383 bills, while the one before it passed 460. The 104th Congress (1995-1996) currently holds the ignominious distinction of being the least productive session of Congress, according to the U.S. House Clerk's Office, which has records going back to 1947. Just 333 bills became law during that two-year period, meaning the 112th Congress needs to send nearly 100 more bills to Obama's desk in the next few days if it wants to avoid going down in history -- an unlikely prospect, considering that both chambers are squarely focused on averting the "fiscal cliff" before the new year. 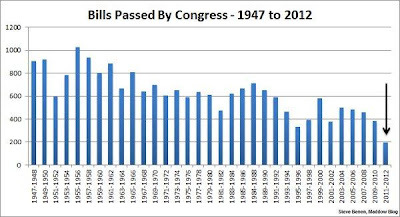 The 112th Congress has done far less than the 80th Congress (1947-1948), which President Harry Truman infamously dubbed the "Do-Nothing Congress." Those lawmakers passed 906 bills that became law. 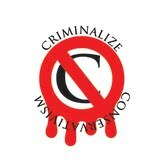 While Obama has signed several pieces of large, consequential legislation in the past two years -- such as sanctions on Iran and the National Defense Authorization Act, allowing the indefinite detention of terrorism suspects without charge -- many of the bills passed by Congress have been small and noncontroversial. At least 40 bills, including ones awaiting Obama's signature, concerned the renaming of post offices or other public buildings. Another six dealt with commemorative coins. Meanwhile, significant pieces of legislation that have traditionally received bipartisan support -- such as the reauthorization of the Violence Against Women Act -- have been blocked. 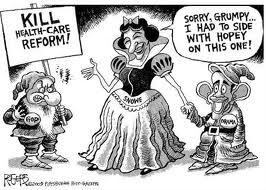 House Republicans have also held votes to repeal Obamacare more than 30 timessince gaining control of the chamber in 2011, despite the fact that such a measure has no chance of passing the Democratically controlled Senate or being signed by Obama. The lack of bipartisanship in Congress has been lost on no one. In April, Thomas Mann of the left-leaning Brookings Institution and Norm Ornstein of the conservative American Enterprise Institute published a Washington Post op-ed saying that the GOP deserves the blame for the dysfunction. "We have been studying Washington politics and Congress for more than 40 years, and never have we seen them this dysfunctional," they wrote. "In our past writings, we have criticized both parties when we believed it was warranted. Today, however, we have no choice but to acknowledge that the core of the problem lies with the Republican Party." Sen. Olympia Snowe (R-Maine) also cited the hyper-partisan, unproductive atmosphere of Congress when she announced her retirement in February. Congress' approval rating currently stands at 18 percent. "Appearing on the CBS Sunday morning news program 'Face the Nation,' Snowe said it was 'unacceptable in today’s environment' that it took the administration’s top intelligence officials 17 days to issue a statement saying that the Benghazi attacks were deliberate and well-organized. Four Americans, including Ambassador J. Christopher Stevens, were killed in the attacks by militant groups." 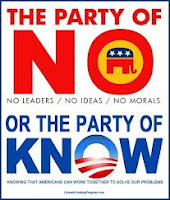 "This is not, by the way, the inevitable result of divided government (one party controlling the House; the other party controlling the Senate). There have been plenty of other Congresses, some quite recently, with a Democratic Senate and a Republican House, but their bill totals weren't nearly this anemic." No Republican officeholder can do anything but lie, and Snowe is no exception; she has carried water for the Conservative leadership in Congress since her first term in office. 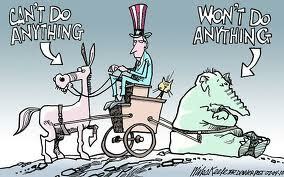 No Republican office holders can stand for re-election unless they faithfully toe the line on each and every vote. Why are the Republicans so successful in standing together while the Democrats often seem to be battling with each other? Because the GOP represents one thing and one thing only - the interests of the greediest of us among the wealthy; the Democrats represent everyone else. When labor argues with Environmentalists, when teachers argue with entrenched unions, they are still fighting the battles of the non-rich. "Some fellows get credit for being conservative when they are only being stupid."